Cindy Jacobs: Christians Must Vote To Stop The US From Polluting Other Countries With Gayness [VIDEO] - Joe.My.God. “Respected prophet” Cindy Jacobs and her husband Mike preached at a church in Ohio last week that is run by Frank Amedia, who has played an important role in mobilizing Pentecostal and Charismatic Christians to support Donald Trump. In their sermon, the Jacobses urged those in the congregation to be sure to vote in November in order to stop the U.S. from promoting LGBT rights throughout the world. Kyle notes that the US ambassador to Costa Rica is not, in fact, gay. But hey, Costa Rica, Dominican Republic, what’s the difference? PREVIOUSLY ON JMG: Cindy Jacobs commands the clouds over Israel to dissipate during a 700 Club photo shoot. Cindy Jacobs says she caused a short woman to grow three inches “on the spot.” Cindy Jacobs says her prayers stopped the shoe-bomber. Cindy Jacobs says her six year-old son prayed away the assassination of Ronald Reagan. Cindy Jacobs prays away her own tumor. 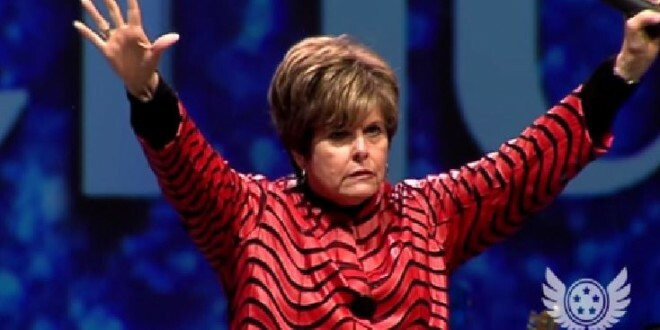 God tells Cindy Jacobs that he’s going to punish America for gay marriage. Cindy Jacobs prays away a terrorist sleeper cell. Cindy Jacobs prays away mental illness (but only in others). Cindy Jacobs prays away a car crash that would have killed David Barton. Cindy Jacobs’ daughter prays away a tornado. Cindy Jacobs prays away the global recession. God sends Cindy Jacobs magical spaghetti. Cindy Jacobs prays away Hurricane Sandy. (It totally didn’t hit Nebraska.) Cindy Jacobs reveals that God killed thousands of birds because of the repeal of DADT.